Logan does not achieve greatness by virtue of its brutal and bloody violence, even if such surface-level talking points dominate discussion about this hard-R-rated superhero picture. Though unique to the genre, particularly in the X-Men franchise to which it belongs, the film’s darkness, its depiction of carnage and prevalence of f-words, and its grim tone speak merely to elements of style. These touches may represent a shift away from the standard PG-13 accessibility of the previous X-Men blockbusters, but they are also surface considerations. Instead, Logan achieves greatness by the way director James Mangold blends emotion, mythology, narrative, and mise-en-scène into an impressive and moving whole. Mangold’s fusion of several genres—road movie, post-apocalyptic actioner, superhero yarn, and most of all the Western—places the character in a world that feels like a child of Cormac McCarthy and Clint Eastwood’s Unforgiven. 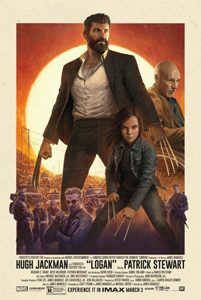 An uncommon comic book film that transcends its label, Logan engages through its harmonious post-modernism and serious treatment of complex characters. Logan arrives on the heels of 2016’s Deadpool, the first 20th Century Fox superhero film with an R rating. Loosely associated with the X-Men franchise, Deadpool’s worldwide earnings of $783 million on its somewhat meager $58 million budget told the studio a restricted MPAA label would not weaken box-office performance. In short order, the already-planned solo adventure of everyone’s favorite adamantium-clawed, cigar-smoking mutant with attitude became an R-rated effort. 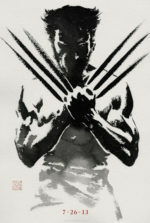 Mangold signed to direct alongside star Hugh Jackman, after the two collaborated on The Wolverine in 2013 (a veritable samurai film that improved in an unrated extended version on home video, complete with R-rated violence and language). For Logan, Mangold conceived the story from Mark Millar’s “Old Man Logan” storyline in the comics, scripting alongside co-writers Scott Frank and Michael Green. And from the outset, when the film opens in 2029 and most mutants have been rounded up or exterminated, the approach resists typical superhero fare. The title alone suggests that Mangold has set out to achieve something different: notice how the studio’s all-important intellectual property of “Wolverine” and “X-Men” go unreferenced. Logan finds the titular hero in a ruined state. Behind a grizzled beard, graying mane, and a weathered, Hellenistic physique, Jackman returns for his reportedly final performance as the character, who is among the last of his kind. The other X-Men have long since dissolved, most of them killed during an allusive “Manchester incident” caused by Charles Xavier (Patrick Stewart), who now suffers from a degenerative brain disease and seizures. With each seizure comes an outpouring of uncontrolled psychic power, resulting in the U.S. government labeling Charles’ brain as a potential WMD. Meanwhile, Logan’s adamantium-laced bones have begun to poison his body, more even than his mutant healing factor can fight. Now in hiding, Logan keeps Charles highly medicated and squirreled away in a collapsed, rusted-out water tower across the Mexican border. 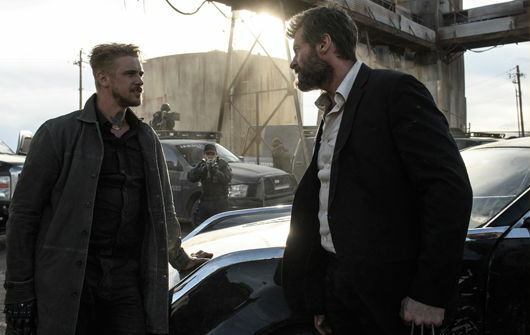 Alongside the albino mutant-tracker Caliban (Stephan Merchant, fantastic), the three keep to themselves; only Logan goes out to earn money as a limo driver. A nurse (Elizabeth Rodriguez) from Transigen, a lab conducting genetic experiments on mutants, approaches Logan and hires him to transport an escaped test subject, the young Laura (Dafne Keen), to a rendezvous in North Dakota. Dubbed X23, Laura hopes to meet with several other escapees at a place called Eden, and then together cross the border into Canada. But Logan refuses the job, believing he must keep Charles safe and sedated—that is, until he’s forced on the road with Charles and Laura when a Transigen security force attacks. A group of cyborgs called Reavers, headed by Donald Pierce (Boyd Holbrook) and overseen by Transigen’s chief geneticist Dr. Rice (Richard E. Grant), remains in pursuit, as both Laura and Logan are vital to their mutant experiments. To be sure, the similarities between Logan and Laura are suspect yet crucial: both heal quickly, both have claws and adamantium bones, and both are prone to feral rages. But once these plot details have been established, the story facilitates a much simpler chase from Point A to Point B, during which the film explores the characters and their deeply felt familial bonds. 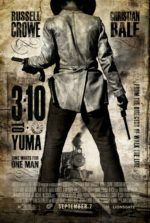 Mangold’s filmmaking contains a richness of influence and innovation inspired by Westerns, a genre he explored a decade ago with 3:10 to Yuma, and two decades ago (albeit indirectly) with the High Noon-inspired Cop Land. Consider how in Logan, just before the road trip begins, a sequence finds Charles and Laura watching Shane, the 1953 classic Western by George Stevens. The moment foreshadows everything to come, setting a tone of bittersweet fatalism and Western mythology. From friendly ranchers who invite Logan and company to a home-cooked meal, to rustler gangs and evil gunslingers in the form of cyborg mercenaries and weaponized clones, Mangold’s film draws from tradition to create something new. His approach is not unlike George Miller’s Max Mad series, specifically The Road Warrior (1981) and Mad Max: Fury Road (2015), which borrows from John Ford’s formative Westerns like Stagecoach (1939). Indeed, there’s also Fordian influence on Mangold. Note how Logan becomes the White Hat hero pitted against his own cloned, Black Hat opposite; or how, just like Miller, much of Logan involves high-velocity car chases on dusty, forgotten roads. Logan has always been the most fascinating X-Man—in the films in particular, given that he’s a consistent narrative focal point. At once broken by a traumatic past and doomed by his inner rage, not to mention his uncertain (and perhaps unending) future, Logan’s life has beaten him to a pulp, physically and psychologically. He’s at his most vulnerable in Logan, ever-unable to forgive himself for his bloody past and weakened by his looming mortality. 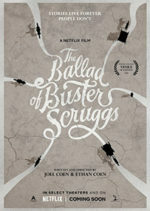 The film explores his character’s enduring issues through poignant scenes that chew the rustic scenery and channel the classic mythology of Westerns, while also demonstrating that, sadly, Logan’s past does not go unpunished. 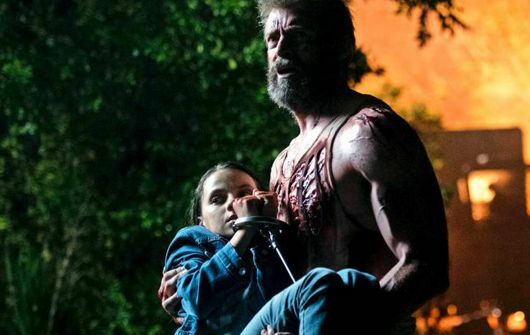 Mangold follows this constant with violence that has consequences; when Logan’s claws enter someone, the result is blood and detached body parts. And when characters we love eventually die, their deaths are not pretty or romanticized. This is a brutal, unrelenting film that finally represents the character in all his implied savagery. And what’s more, Jackman has never been better. Alas, by no fault of Mangold or his contributions to the franchise, Fox’s X-Men universe on film has been disjointed and confused for years. Several re-conceptualizations have attempted to undo past creative mistakes (we’re looking at you, X-Men: The Last Stand and X-Men Origins: Wolverine), while the concurrent soft reboot remains oddly separate from Logan. Nothing really makes sense in the X-Men franchise in terms of story continuity, and Fox shows no signs of organizing their efforts anytime soon. And so, finding a place for Logan in the overall series may prove somewhat troublesome; though, as a stand-alone film or even a long-after-the-fact sequel to The Wolverine, the film stands as a series best and among the most accomplished superhero films to date (if the “superhero” label even applies at all). This is an exceptionally well-crafted picture full of emotion, thematic substance, several incredible performances, and prevailing senses of finality and singularity—all in a franchise that often feels scattershot. But it’s best not to think of Logan as an X-film; rather, think of it as a Western journey that ends with a destination that is manifest and, perhaps, destiny.